Once in awhile due to wear and tear, faulty installation, or something accidentally puncturing it, a plumbing pipe will spring a water leak. This is certainly not one of the best things a homeowner can experience. 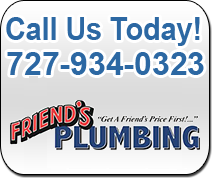 After shutting off the main water valve, it’s time to pick up the phone and call a trusted local plumber. 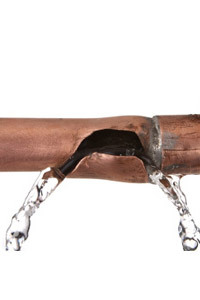 Some leaks are not as noticeably as others and may cause structural damage before it’s noticed. In either case, Friend’s Plumbing can help. We provide annual plumbing checkups to prevent such occurrences from happening and we also have the experience to repair water leaks in the plumbing if and when they do occur. Water plumbing leaks are a common problem that we have been providing a solution to for over 30 years. 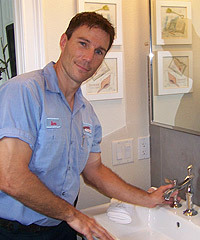 Our water leak repair services are performed to accurately pinpoint the problem and get the plumbing leak fixed fast. Our routine water pipe inspections are a great way to help prevent water leaks as we find problems before they occur. See why we are the most trusted water leak repair company in the area.